Sure, give the gift of "in my f#%^&* way!" ... I hate giant gifts! Plus.... Nothing says "holiday" like the Addams Family. In Fact, I think they could do an Anti-Christ-mas special. Maybe a variety type thing. Get Marilyn Manson to sing a few of the standard. In fact why not Charles Manson. Really, what a dumb gift! The least they could have done was make it the 1960s Addams Family instead of these imposters! 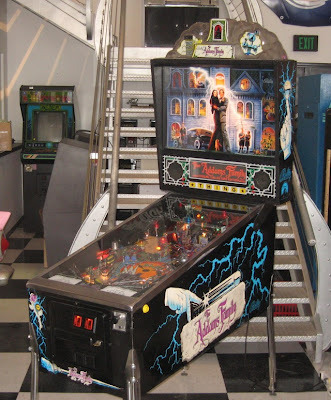 Addams Family Pinball is the number one selling pinball of all time. TAF FTW. That doesn't mean it's a "great gift" The Ford Taurus is one of the best selling cars of all time and it's.....lame. This is THE best pinball machine ever. Worth about 4-5 grand.